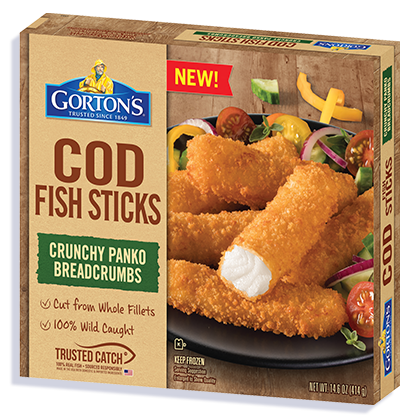 Crunchy panko breaded fish sticks cut from whole, wild-caught Cod fillets. The perfect fit for an easy evening meal, our extra-large Fish Sticks are coated in crunchy panko breadcrumbs and made with wild-caught Cod fillets. Just remember to leave room on your plate for dipping sauce. 3. BAKE 20-24 minutes total*. Flip after 14 minutes. *FULLY COOK FISH TO AN INTERNAL TEMPERATURE OF 155°F OR HIGHER BEFORE SERVING. INGREDIENTS: Cod fillets, breadcrumb coating, vegetable oil. Wheat flour, water, yellow corn flour, sugar, salt, palm oil, onion powder, whey, baking powder (baking soda, sodium aluminum phosphate, cream of tartar), yeast, natural flavor.